In Amoris Laetitia (“The Joy of Love”), Pope Francis speaks about infertility with straight-forward language: “Some couples are unable to have children. We know that this can be a cause of real suffering for them” (no. 178). Indeed, “real suffering” is an apt description of the challenge infertility brings to men, women, and marriages. At their wedding, husband and wife promise to “accept children lovingly from God.” When children do not come, month after month, or year after year, couples indeed suffer. For those in the trenches of infertility, or for the friends and family members who love them, Jean Dimech-Juchniewicz’s book Facing Infertility: A Catholic Approach provides reliable advice and much encouragement. Dimech-Juchniewicz writes of an experience she knows well. In the introduction, she describes the many effects infertility had on her life and marriage: enduring invasive medical tests, monthly hope-and-disappointment cycles that to her “felt like a funeral”, stress on her relationship with her husband, the mixed emotions when hearing pregnancy announcements, and so on. The fact that the author knows infertility “from the inside” lends a deep sense of empathy to her book, and the feel of a companion walking alongside the reader. She also opens each chapter with a short vignette from other people facing infertility, giving another voice to aspects of this trial. The chapters of Facing Infertility proceed in a roughly chronological manner, starting with “Expecting Fruitfulness,” then working through the various stages of denial, understanding moral medical options, dealing with a range of emotions (sadness, anger, jealousy, etc.) and finally “Coming to the End of Our Journey.” Couples may feel drawn to the chapter that addresses their current experience. The appendices provide distinctive spiritual support: prayers for Catholics struggling with infertility, men and women in Scripture who experienced infertility, and patron saints to pray to. Finally, the additional resources point readers to Church documents, medical resources, websites and more (with the caveat that the book was published in 2012 so some may be outdated). Each of the eleven chapters in Facing Infertility closes with questions for reflection and discussion, advice for friends and family, and a prayer. The questions can be used for personal reflection or for discussion with one’s spouse. As discussion prompts, they can help a couple broach some of the difficult topics that come up when spouses face infertility, such as: Which medical procedures are we comfortable with? When will we know to stop medical treatment? What comes next? Infertility is a highly emotional experience for both wives and husbands. Reading a book like this together, and talking through some of its questions, can help spouses make sure that they are journeying together on this difficult path. The brief “For Friends and Family” sections, also at the end of each chapter, serve a valuable purpose as well. Often a couple’s loved ones don’t know what to say or do when they find out that the couple is struggling with infertility. Well-intentioned friends or family members might say or do things that only cause more pain or alienation. Dimech-Juchniewicz gives good advice on how to accompany a friend or relative who is bearing the cross of infertility. For example, “Know that you do not need to offer advice in order to be supportive and compassionate. Unless they ask for your advice, it may be wise not to share it” (p. 46). Facing Infertility does what it promises: it provides a Catholic approach to one of the difficult challenges a married couple can face. It addresses infertility holistically, not only from a medical perspective as many other books do but also emotional, spiritual, and relational. 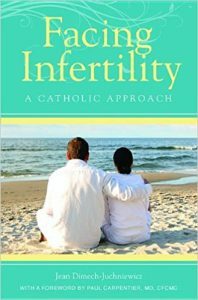 For any Catholic couple experiencing infertility, or for anyone who knows a couple who is, this book is a valuable reference. Bethany Meola is the assistant director of the USCCB Secretariat of Laity, Marriage, Family Life and Youth. She and her husband Dan strive to live a life of family prayer together in their home in Maryland.